For most lifters training legs is a love/hate relationship. On the one hand, having a good, solid base benefits the entire physique. On the other hand, leg training is painful, requiring heavy weights and will-testing intensity that resets your base level of pain tolerance. Add to that the fact that legs are not, by definition, the most visible muscles in street clothes, and the question of whether to put forth the effort required for jeans-busting legs is an open one at best. For competitive bodybuilders the question has an answer. You can’t hide weak legs in posing trunks, and there’s nothing worse than standing onstage after putting your all into a precontest diet only to find that you came in second to a competitor who could zipper a huge set of quads. Outside of competitive bodybuilding there are more practical reasons for people to put in the work required to develop a quality set of tree-trunk legs. For one, injury prevention. The old canard that squatting is bad is, thankfully, dying at last. As a matter of fact, the core- and knee-strengthening benefits of squatting with proper form become more apparent as the ongoing research comes out. Beyond that is the physical health benefits of strength training, many of which are regularly reported in this magazine. So, if training legs will make you look better in shorts and jeans, and if there’s a known benefit to strength training your entire body, it makes sense that a little short-term pain is worth the long-term health benefits that leg training can provide. 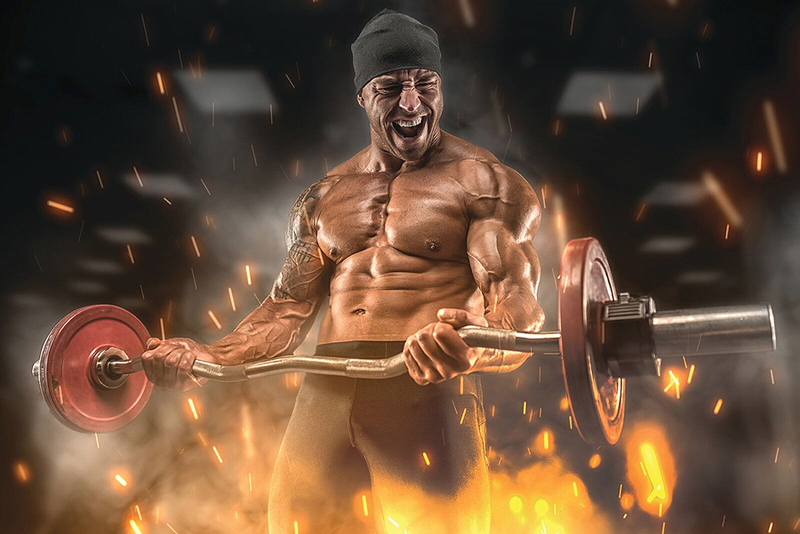 With that thought in mind I searched out national-level competitor Abbas Khatami to get his thoughts on training these largest of muscles more effectively. Khatami has been competing in the NPC since 1995. Since ’98 he’s finished outside of the top five in his weight class only once (at the ’02 Nationals, where he took seventh). He got his lowest contest placing in his first attempt on the national stage, at the ’99 Nationals, where he finished 11th. Outside of those two showings, his contest history reads like a continually progressing success story, with fifth-, fourth- and third-place finishes dotting his résumé, and two superheavyweight-class wins at the IFBB North American Championships, in 2004 and ’09. In both cases he just missed qualifying for an IFBB pro card, getting beaten out by the winner of the heavyweight class. Abbas’ parents are of Persian and German descent. He was born in Virginia but moved to California after earning a degree in nutrition from Arizona State University. While a Sun Devil, Abbas discovered bodybuilding and found himself winning the heavyweights at the ’95 NPC Collegiate National Championships. In 1997, partly due to bodybuilding and partly due to the climate and his allergies, Khatami decided to relocate to California for good and try to make a go of bodybuilding while establishing his nutrition-consulting business. After working his way up the NPC ranks, he signed on as a Muscle Asylum athlete, which offered him some financial flexibility so he could continue his career in the sport. Like many competitors at the top, Abbas uses weights and reps in his quad routine that are out of reach for most beginning and intermediate trainees. His goals are to win bodybuilding shows and turn pro; yours might be to stay healthy and live longer. Abbas understands those goals as well. He feels that anyone can apply his workout principles and see results. Abbas’ first piece of advice is that training legs is about “want to.” As with so many things in life, you have to want to make your legs grow before they will. How you go about that can be telling as well. Abbas’ leg training contains nothing that can’t be done by most lifters. His quad routine focuses on basic lifts, including leg extensions, squats, walking lunges and leg presses. Most top competitors use tried-and-true movements, and Abbas is no exception. “There’s really not a whole lot you can do for legs,” he says, “especially since good form is the key to staying injury free when using the heavy weights that legs require to grow.” I know, I know—I just said that Abbas doesn’t go superheavy, and that he focuses more on creating blood volume, but everything is relative. He’s still lifting prodigious weights, pyramiding up, etc. What he stays away from are superheavy sets that overstress the joints. Whatever the method, it’s been effective. Abbas has been using the same leg workout for 10 years— with some minor adjustments for precontest—and he’s remained relatively injury free. It’s his commitment to proper form and full warmups that has enabled him to make steady gains throughout his bodybuilding career. One thing about Khatami’s blood-volume training is that the set’s not over until he completes a high number of reps. That means rep counts of 15 for all working quad and hamstring sets and 20 or more for all warmup sets and working calf sets. “You’ve got to pump a lot of blood into these big muscles, and the only way to do that is with high reps,” he says. It’s also important to stretch after every set and really get all you can out of each movement. If you choose weights that are too light, you don’t stimulate blood flow; if you choose weights that are too heavy, you reach failure before the muscles are truly engorged. In short, blood-volume training is a balancing act, and it takes time to determine the best combination for unlocking the growth in your legs. Abbas believes that his personal journey winding through the NPC has gone on long enough. His recent third-place showing in the superheavyweight class at the ’09 Nationals was not what he had hoped, but after almost 15 years of competing and finding himself on the brink of turning pro multiple times, he’s heading into the 2010 season with confidence in the improvements he’s made and a pro card in his sights. Boyz (and Girlz) in the Hood!